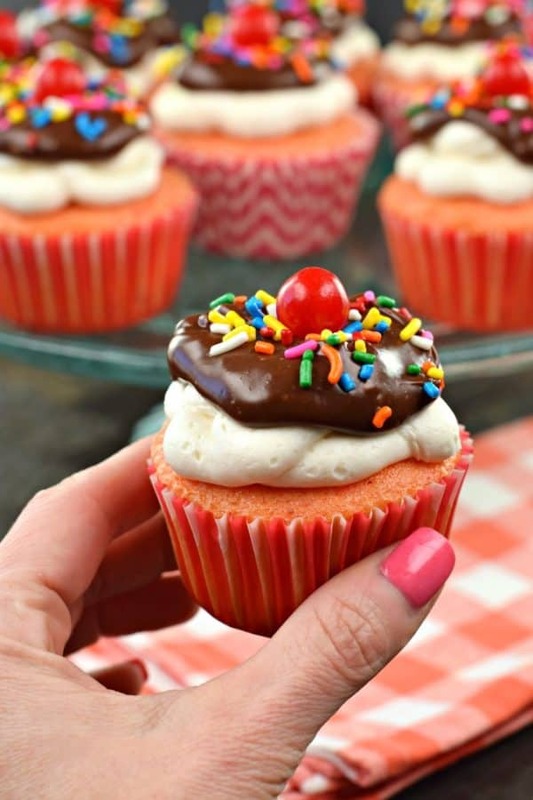 These Hot Fudge Sundae Cupcakes are fluffy strawberry cupcakes topped with sweet swirls of vanilla buttercream, homemade chocolate ganache, sprinkles, and a cherry on top! 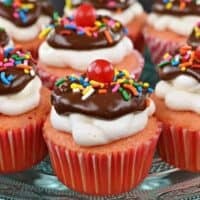 Lately I’ve been turning some of my favorite ice cream desserts into cupcakes. Remember last month I made this Chocolate Vanilla Swirl frosting on a chocolate cupcake? It’s like a zebra cone (or twist cone)! 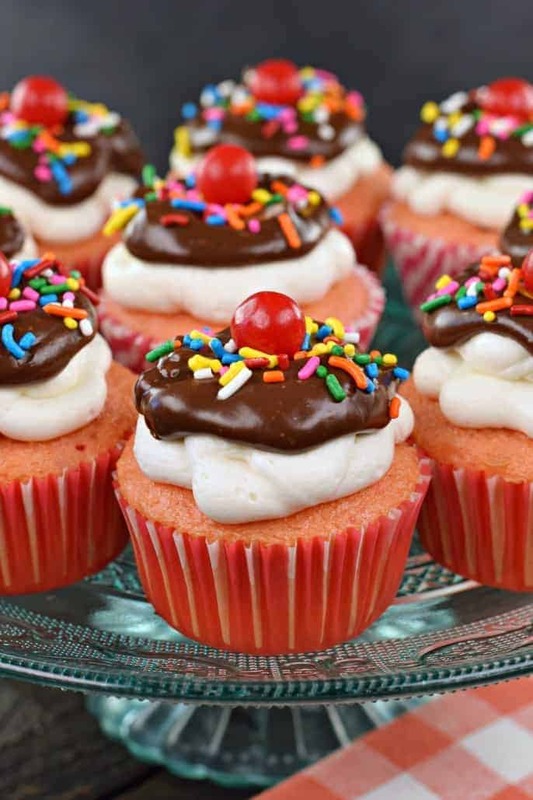 Well today we’re making Hot Fudge Sundae Cupcakes! I remember being a kid and getting hot fudge sundaes at the local ice cream shop. 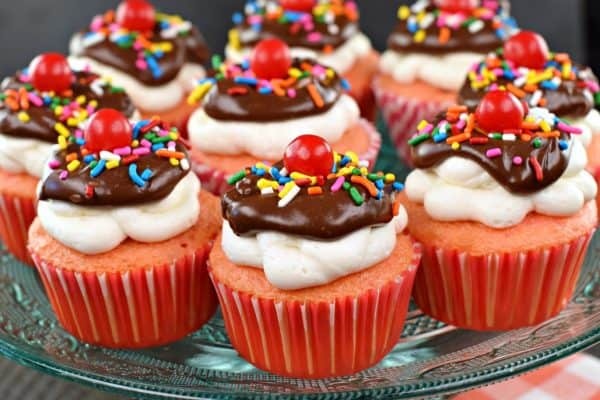 They would be topped with strawberry sauce, hot fudge, sprinkles, whipped cream, and of course a cherry on top! Today’s cupcake recipe starts with a Strawberry Cupcake. I used a box mix, so that I could get a nice solid base, plus I was cutting time when I made these. 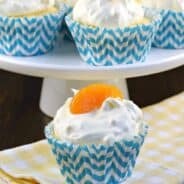 I had already made a batch of homemade chocolate cupcakes that day, as well as these Lemon Cupcakes with Lemon Whipped Cream Frosting. If you have a favorite strawberry cupcake recipe from scratch, feel free to use it (and send it to me too…I’m in need of a new one!). To mimic the whipped cream on my childhood favorite ice cream sundae, I used my delicious vanilla buttercream frosting recipe. It’s out of this world!! Start by baking a batch of Strawberry Cupcakes. 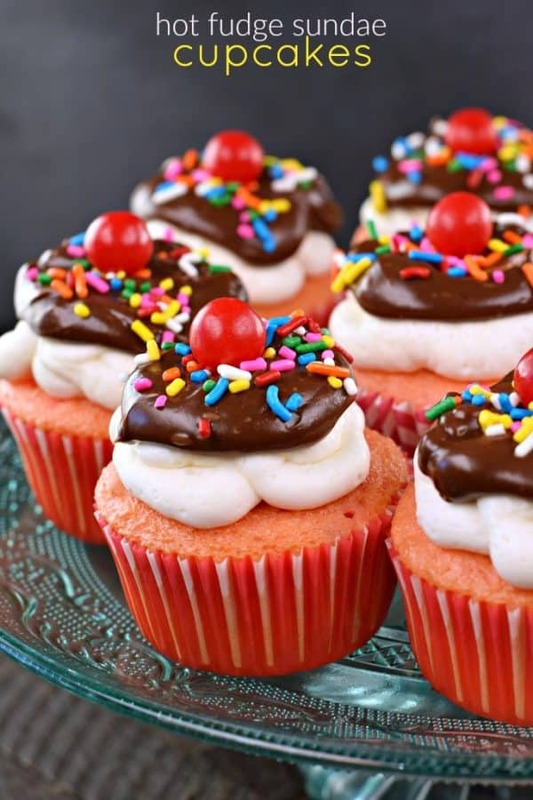 Either use a mix or this delicious Strawberry Cupcake recipe. Prepare them according to package (recipe) and allow them to cool completely on a wire rack. Next, whip up a batch of creamy vanilla buttercream frosting. I love to use this recipe with fresh vanilla beans, but if they’re too pricey for you, just use a pure vanilla extract. I usually have a bottle of Vanilla Paste on hand at all times. It’s the best of both worlds. You get the vanilla extract and the beans in a rich, fragrant flavored paste! You’ll also need to make a chocolate ganache. I like to use a good quality chocolate for this, as you want it to taste amazing, and melt smooth. 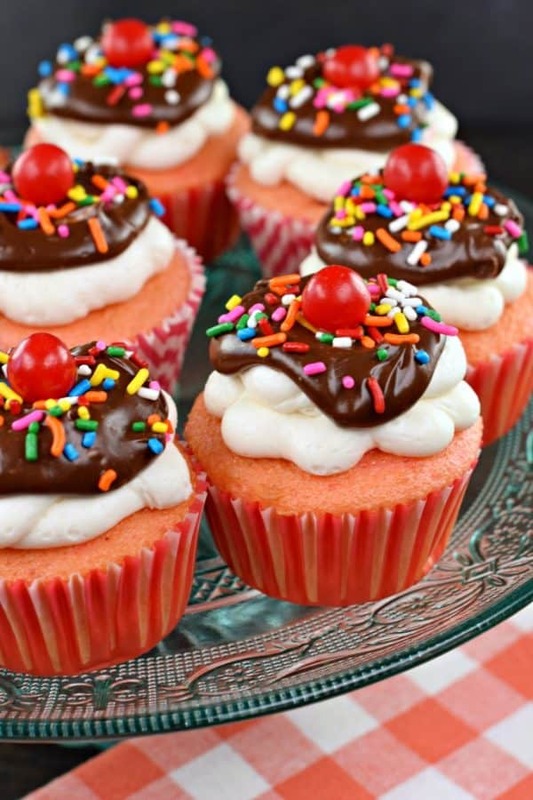 Finally, you’ll need some sprinkles and a “cherry on top.” You can use a red gumball, or even a peanut M&M’s. I happened to find a red cherry sour ball (much like a lemon drop). And that’s how you make a cupcake look like an ice cream sundae! First, you’ll need a cupcake tin and paper liners. I like to get my liners from here, as they are greaseproof, which means the color of the liner won’t fade as you bake! I also like to use a LARGE cookie scoop to portion out the cupcake batter. This 3 Tbsp scoop is usually perfect! For today’s recipe you don’t need a special pastry bag and tips. I just used a large gallon sized ziploc bag, snipped off the corner, and piped big dollops onto each cupcake. Be generous…this is your “ice cream” layer…and everyone loves a double scoop, haha! 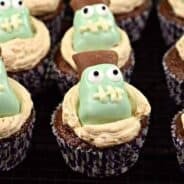 Looking for more fun cupcake ideas? This fudgy, decadent Copycat Hostess Cupcake recipe looks and tastes like the real thing. Only better, I promise! 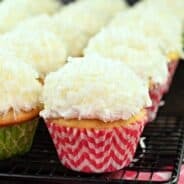 How fun are these Raspberry Lemonade Cupcakes with their swirl of sweet frosting? Add a paper straw to complete the look! These Watermelon Cupcakes are my oldest daughter’s favorite treat. She usually asks me to make these at least once a year! Remember malt shops? This Chocolate Malt Cupcake recipe with Vanilla Malt Buttercream has a hint of malt and is topped with a fluffy buttercream infused with even more malt flavor. Prepare strawberry cake according to package directions for 24 cupcakes. Cool completely on a wire rack before adding frosting. For the frosting, beat butter with an electric mixer for 3-5 minutes, until pale yellow and smooth. Add in powdered sugar, vanilla bean paste, and milk. Beat for an additional 3-5 minutes, until fluffy. Using a large ziploc bag, fill with the frosting. Snip off the corner and pipe onto each cupcake (pattern doesn't matter). For the ganache, place the chocolate and heavy cream in a glass bowl. Heat in microwave for 1 minute. Remove and stir until smooth. Cool 5 minutes, then spoon over the frosting. Add sprinkles and "cherry on top" immediately. ENJOY! Beautiful; made for childrens’ birthdays! Thank you so much !